Horse hooves, similar to human fingernails, need to be trimmed regularly as excessive growth weakens durability and causes them to split, crack, chip or break off. Plus, excessive trimming can be painful and lead to significant complications in everyday activities. To maintain optimal hoof health for barefoot horses, it is important for horse owners to continue regular trimming cycles, and provide proper care to hooves when they’re sore. Because horses are on their feet all day, proper trimming and overall hoof care are vital to their wellbeing. 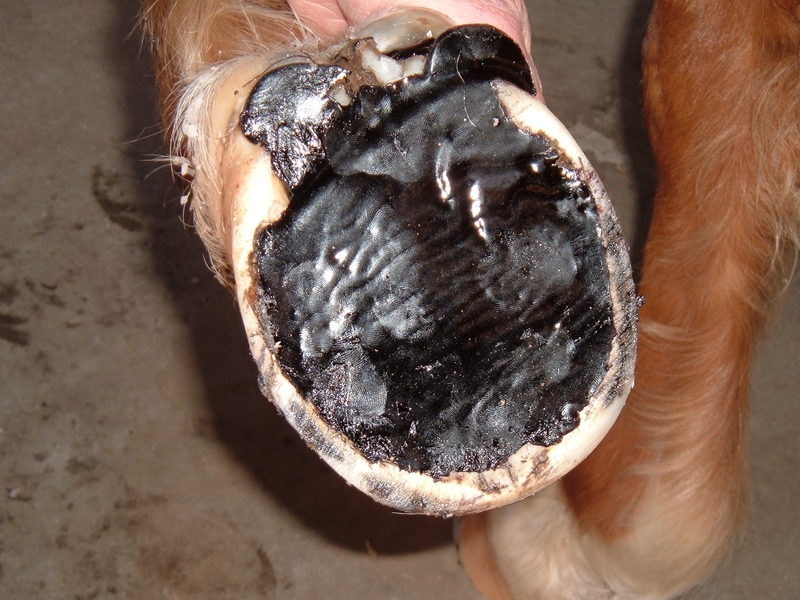 Soles protect and help support a horse’s hoof and also require regular maintenance and exams. With a sore foot, a horse can experience extreme pain and discomfort, which can develop into bruising, injury or even lameness. Many factors can contribute to the soreness of a barefoot horse’s hooves after a visit with their farrier, the most common one being over-trimming. Soles can become too thin from an improper trim as too much of a horse’s foot is removed and the inside sole is too high causing the horse to place its weight on the sole instead of the outside wall. A sore horse may adjust the distribution of its body weight to keep the pressure off the sensitive hoof which can drastically alter a horse’s routine. Environmental changes – As the seasons change, horses’ hoof hardness and growth rates change with the weather patterns. Before a farrier begins trimming, it is important to check weather forecasts to determine what level of trimming is required. With more moisture in the air, feet tend to be softer and require less trimming in the winter. During warmer and dry seasons, horse hooves are stronger and grow quicker, thus a more aggressive trim is sufficient. Evaluate the hooves – Keeping up with regular trimming cycles allow farriers to monitor hoof health regularly. It is vital that hoof care professionals become familiar with the growth rate of their horses’ feet to provide a proper trim. Maintaining and protecting a barefoot horse comes with extra precautions due to the exposure of their soles and hooves. If a horse is over-trimmed, a temporary shoe, like Super-Fast, can be applied to help provide more support during regrowth. Vettec’s Super-Fast is a durable, fast-and hard-setting, urethane formula that is ideal for creating custom shoes directly on the foot when nailing is not an option. Pour-in pad materials, like Sole-Guard, also help to increase sole depth and provide extra support for barefoot horses after soreness has subsided. Vettec’s Sole-Guard is easy to apply, durable and commonly used as a protective layer that lasts through tough conditions. Sole-Guard is a fast-setting, liquid urethane pour-in pad material providing strong support that retains its shape and flexibility indefinitely. It is designed to use without shoes and adheres to the sole sealing out moisture and debris, protecting both the frog and the sole. Talk to your farrier or veterinarian about best trimming practices, how pour-in pad materials can be a helpful tool after improper trimming and maintain healthy barefoot hooves.